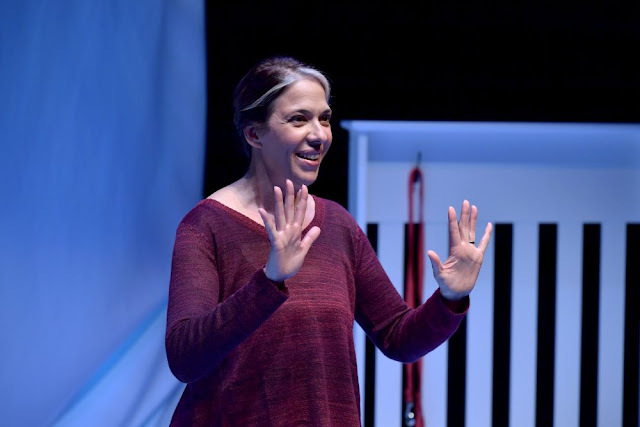 Melinda Lopez’s solo performance Mala (produced by the Huntington Theatre at the Calderwood Pavilion) is a reflection on the aging and deaths of her Cuban émigré parents and especially of her mother, who, her body weakened, her mind softening, overcome by terror and anger, calls her daughter mala (a bad person). The idea of the piece is that Lopez’s exhaustion with her mother’s demands and her uncertainty about how to handle her make her question whether or not she is that thing her mother accuses her of being. But the self-interrogation at the core of the play is disingenuous. There was never a moment during Mala’s eighty-minute running time when I believed that Lopez seriously questioned her own virtuousness as she related her tireless at-home care for her mother, her anticipation of what it would be like for the older woman to slip away from life (as her father already had), her response to her mother’s apparent obliviousness – understandable, of course, under the physical and psychological circumstances – to Lopez’s uninterrupted devotion. The piece is a celebration of Lopez’s sensitivity; her sensitivity is, in fact, the tissue of which the play is constructed. And I grew very weary of it, and finally resentful that I was set up in scene after scene to admire it. The play is so badly written and the performance is so thin and tepid that you can’t rule out the possibility that Lopez might have intended something quite different. Mala has no dramatic construction: the text rambles from one time period to another, one episode to another, as if she’d never gotten around to converting the notes on her phone – which she jotted down while the events were occurring – to dramatic form at all. It isn’t necessary, of course, that the narrative be linear, but we do need to know why, when Lopez leaps backwards or forwards in time, she’s chosen to juxtapose those particular parts of the story, and somewhere in the middle of the piece I gave up trying to figure out the rationale. Lopez’s strategy as an actor is a kind of muted stand-up approach that keeps melting into sentimentality. She doesn’t give a performance; she works the room, relying on a small collection of physical and especially vocal tropes to tug at the audience’s heartstrings. She looks continually stricken, joking heroically, her voice tremulous, as life makes mincemeat out of her. David Dower is listed as director, but there’s virtually no staging. Kristine Holmes’s scenic design consists of a few pieces of furniture, a plate of clementines (of symbolic importance in the text) and three upstage curtains, gathered at the bottom like the folds on a fairy-tale gown, on which key words and phrases are unnecessarily projected. And that’s about it. I’ve seen actors achieve miracles with even less, but there’s so little variety in Mala that the modesty of the scenic elements adds to the sensory deprivation of the performance. Eighty minutes feels like an eternity. Inventory Management, Vol VI: Gotta Go Fast!